This morning I was invited to attend a talk with Jamie Oliver to discuss child hood obesity and the governments new ‘Plan for Action’. The panel was presented by channel 4’s Jackie Long. Jamie was also joined by Dr Dawn Harper, Olympic gold medalist, James Cracknell and Justine Roberts, CEO & Founder of Mumsnet. Jamie has been campaigning for the government to do more to tackle this national health problem. He wants to ensure that parents are well informed about nutrition, as well as suggesting that the government should bring in laws for food suppliers and manufactures, that will help us all to make healthier food choices. Earlier this year the government released their strategy for ‘Childhood Obesity : A plan for action‘ which was created to significantly reduce childhood obesity and to implement radical change across the country. However, the strategy has been hugely criticised and described as a ‘diluted version’ of what campaigners had hoped for. Jamie Oliver is featured in tonight Dispatches programme on channel 4, he speaks very passionately about his disappointment and frustration at the government and in particular Theresa May. So what can the government do about this crisis and what’s going to happen to our kids if nothing changes? The stats show that today a third of young people (aged 2-15) are overweight or obese. One in every three kids! I’m so shocked by this! People that are obese are far more likely to develop type two diabetes and many other health problem. It’s estimated that last year the NHS spent over 5 billion pounds on illness related to obesity. Many of these illnesses are totally preventable. It’s an insane about of money that the NHS can not sustain, it’s scary to consider what the next generation will face if the NHS collapses. Will they inherit yet another debt from our generation? As a mum, I know that nothing is more important to a parent then their child’s health. I don’t know a single parent that would purposely cause their child harm. Yet their diet habits could be doing just that. Throughout my pregnancy I read books about babies and child development, I attended anti natal classes and I was given a lot of information from my GP and children’s centre about pregnancy, birth and the early years. Most of this information focuses on things such as vaccinations and breast feeding. There was very little nutritional guidance for babies after the first twelve months. It was suggested by somebody at the talk today, that children should have an annual health check that includes them being weighed each year until they leave secondary school. We’re legally required to MOT and service our cars each year, shouldn’t our health be a higher priority? As someone with a passion for health and fitness, I am relatively well informed about nutrition. However, there is a lot of contradictory advise and lots of misleading food labels. Many brands advertise their food as ‘healthy’ when they are actually packed full of sugar and chemicals that I can’t even pronounce. In an ideal world we would prepare all of food ourselves and make everything using fresh ingredients from scratch, but let’s be honest, we all have extremely busy lives and sometimes it’s just not possible. I’ve written about this topic before, often health bloggers get a lot of stick about the issue of cost. It’s not affordable for everyone to buy organic veggies and fancy on trend superfoods. That said though, there are of course many ways to cook healthy affordable meals but this can be difficult. Dr Dawn Harper made a comment that ‘Supermarkets offer hundred of buy one get one free offers for unhealthy foods. Let’s have buy one get one free on broccoli and salmon‘ Statistically, families with lower incomes have a higher rate of obesity related illness. The issue of cost can not be ignored. The government certainly needs to do more to support those people but as individuals we have to take responsibility for our own health and our food choices. Most people have seen the ‘5 a day’ campaign. Many food products now display the calories and nutrition info on the front as well as on the back. I don’t think that people can plead ignorance. We all know that eating a banana is better for us than eating an ice cream. Essentially, we recognise what is healthy and what is not. Maybe what we don’t know, is the direct impact that certain foods have on our health. Perhaps this is where we need more education? I was incredibly inspired by todays talk and I applaud Jamie for taking on this massive task. 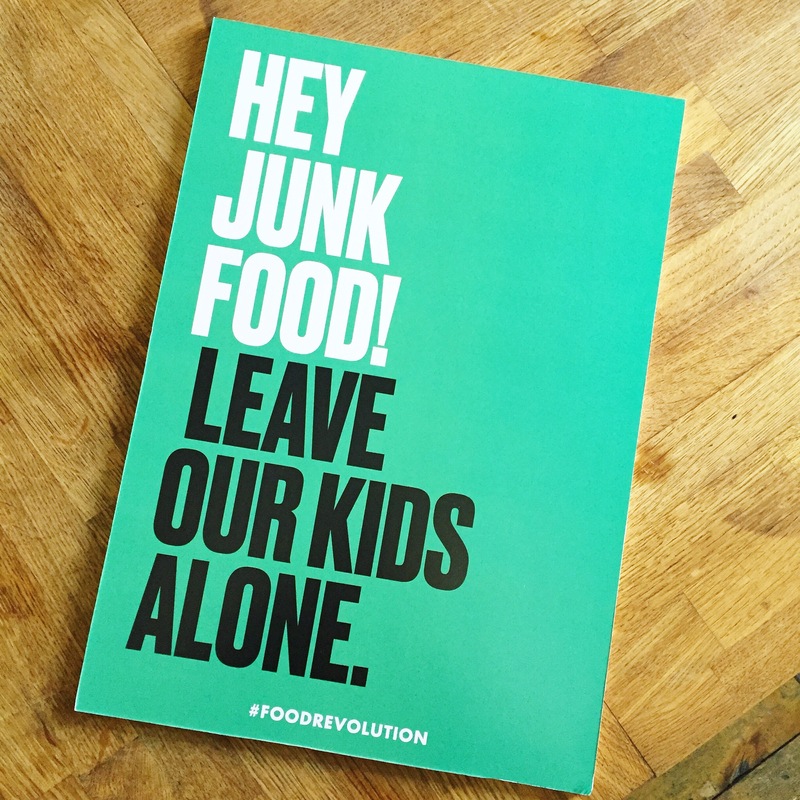 Many things are contributing to the childhood obesity crisis, tv ads, portion sizes, food labels etc but ultimately they do not negate the fact that parents have a huge responsibly for the health of their children. Especially if your children are young. As parents, we buy the food, we prepare the food and we can lead by example. We all have a voice and we can get behind the #TellTheresa campaign.